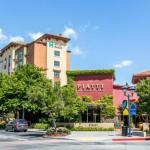 Free hot breakfast spacious kitchen suites free Wi-Fi a year-round pool and Great America three miles away satisfy our guests at the non-smoking Hyatt House Santa Clara. The seven-floor Hyatt House Santa Clara has 150 spacious studio and one-bedroom suites. smartly designed with sitting areas full kitchens plush beds free Wi-Fi iPod docking stations with soothing sound machines and flat-panel TVs with expanded cable. The free hot breakfast includes made-to-order omelettes and a rotating menu of pancakes sausage bacon hash browns cereal baked goods fresh fruit yogurt and drinks. The hotel's full-service Hbar serves a "Sip + Savor" menu of cocktails and small meals. Any time of the year is the right time for a swim in the year-round heated pool. The hotel also has free parking a free airport shuttle a fitness center an on-site market a laundry facility and an outdoor patio with built-in barbeque. The Hyatt House is off the Montague Expressway three miles east of California's Great America. If you're driving from Norman Y. Mineta San Jose International Airport the hotel is four miles north.